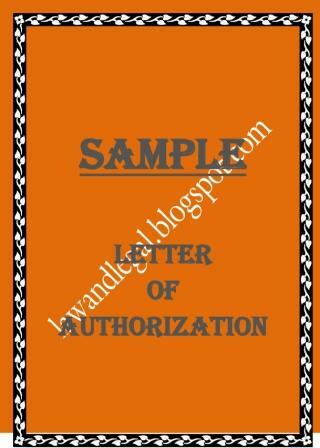 Here is a format of letter of authorisation. An individual (a person) is authorising another to do certain acts on his behalf. A PDF version of the format can be downloaded from the link given below. ______(1)_______ (Name), son/daughter/wife of __________, resident of ___________________________ (address with Post Office & Police Station), is hereby authorized by me to take delivery on my behalf and for me the original L.I.C. Policy Bond in my name having Policy No. _________ from the Life Insurance Corporation of India, _______ Branch, ______________ (address).